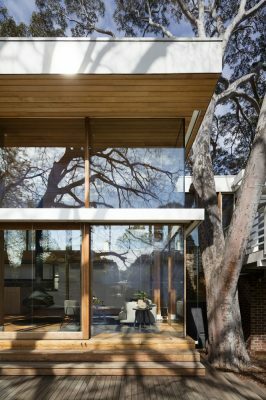 The site is located in Camberwell, Victoria on a unique L shape block, overlooking a leafy park. The existing architecture is rendered precast at first floor, sitting on external clinker brick planes at its base. Its living areas were originally situated at first floor. The brief was mostly pragmatic. More space for a large family, better zoning, and importantly to create a better connection to the outdoors but not lose the stunning views of the neighbouring parkland. 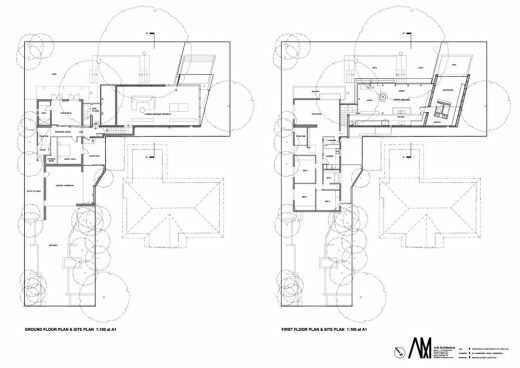 To resolve this common negotiation, we created a new split level for the living areas and the entry experience was re-routed to this new centre which now served as a connecting element to very clear zoning, Kids, Parents, Guests, Living and outdoors. The feeling of being in the new space is of standing on-top the fence, in total connection with the park, with the split level allowing a lofty ceiling to accept the leafy aspect. The pavilion concept emerged organically from here. Timber posts form the boundaries of a “pavilion” and support a timber lined canopy overhead. 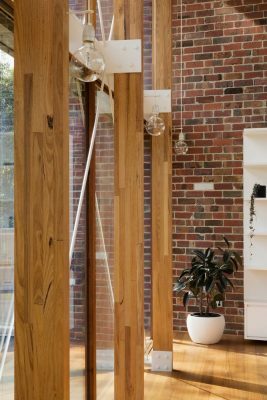 The rhythm of these posts creates a tactility and depth to the edg-es of the space, modulating the hardness of the glass surface. 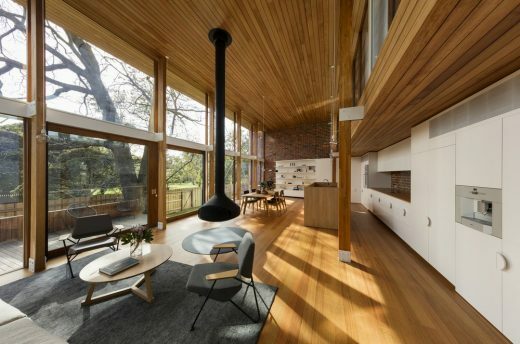 The external clinker brick planes re-appear to bookend the new interior, suggesting that the living areas are an external space. 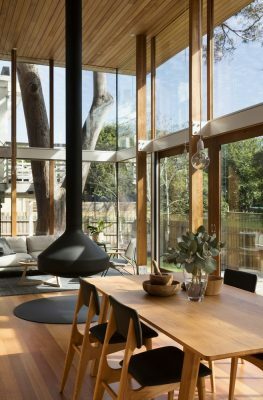 Sim-ple ceramic pendant lights drape down at each post location and a dramatic fireplace reinforce the verticality of both the space and the neighbouring trees. 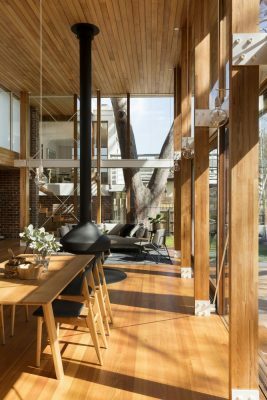 The space defers to its mid-century roots in its horizontality, honesty in steel connections and braces, natural materials and joinery details. 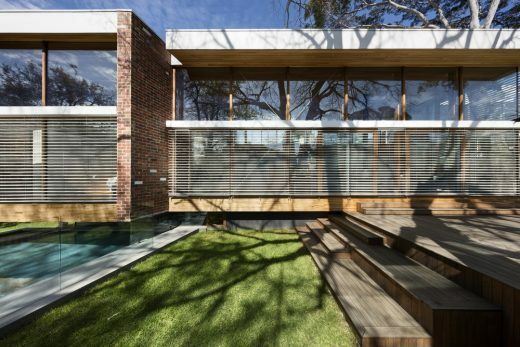 An external venetian blind enlarges the ubiquitous 50’s venetian, and the space is furnished with mid-century but forward looking furniture. The new living areas have been sited to face north east and north west. 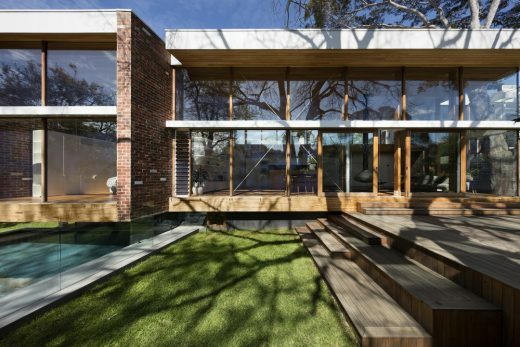 Large expanses of glass are utilized take in the natural beauty and allow winter sun to penetrate deep into the space. To bal-ance the large expanses of glass, we used a high performance insulated glazed unit with a low E coating. Large internal walls of face brick have been judiciously placed to allow their thermal mass to ac-cept morning, midday and afternoon sun, and regulate internal temperatures all year around. Sun penetration is regulated with northern eaves and an external venetian that spans the entire length of the main north eastern and north western façades. 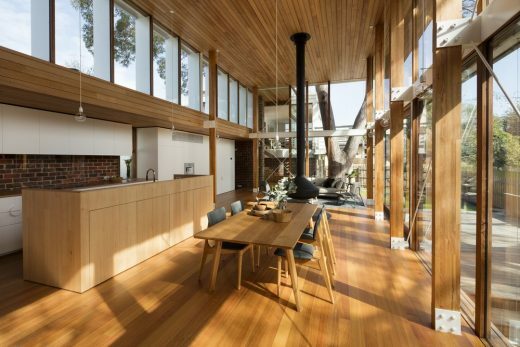 All new spaces are naturally cross ventilated, and all natural timber Is native plantation oak. 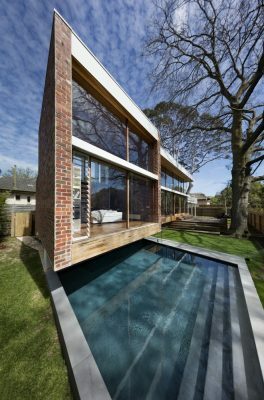 High level clerestory windows are protected from the late western sun by deep fins than mirror the rhythm of glazing and architectural breakup on the existing home. These serve to block hot sun, but also catch the colour of the late afternoon sun to create a warm ambience in the lofty spaces.